Suffolk Tree Services Ltd is a fully professional tree management company operating comprehensive tree and woodland management services throughout East Anglia. Our philosophy and aim is to undertake a superior quality of work in every aspect of arboriculture, from small private client work to large commercial and local authority contracts. 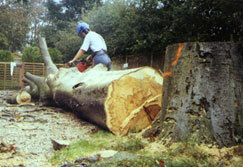 As tree surgeons we offer sound and honest advice on the many and diverse projects undertaken by our clients. We strive to raise awareness of the importance of trees in our landscape in today's environmentally conscious world and to ensure that trees under our clients' care are managed responsibly from the view point of conservation, health and safety issues and liability. Our customers include Local Authorities, Structural Engineers, Highway Authorities, Private Estates, Builders and Developers and many private individuals. Suffolk Tree Services Ltd cares for all our customers, large and small, on a personal and individual basis. The complete services available from us and information on trees and tree care, can be found within this website. November 2012 Worried about Ash Dieback disease (Clalara fraxinea) please ring to arrange an appointment for us to come and advise you. July 2011 We are now on YouTube. A company profile video highlighting the wide range of services we offer. September 2010 Sawn timber sale at our yard generated a lot of interest from wood turners and cabnet makers. September 2009 Latest 21 meter access platform now enables us to reach new heights.